I’ve been quietly working on a new project that just recently went into a closed beta release. Back in college, I was studying a lot of information security. 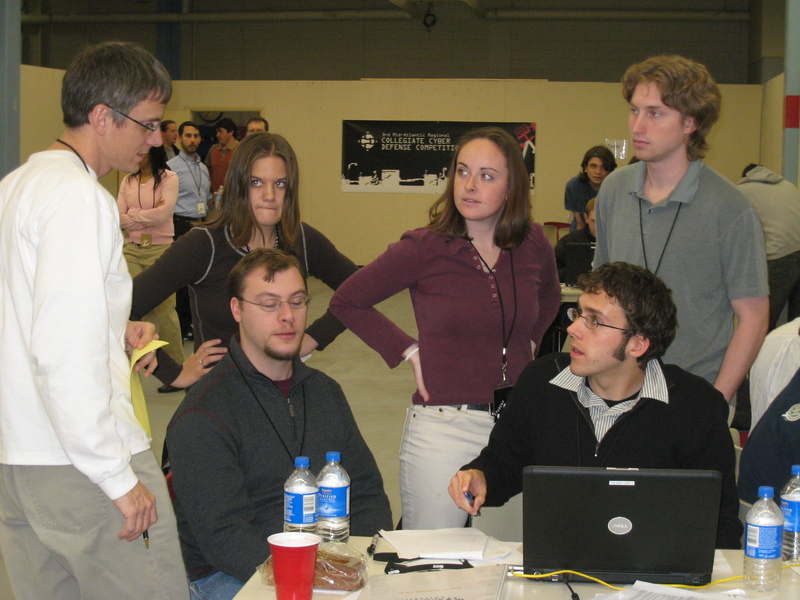 I was even on my university’s cyber defense team where we competed at a regional competition to defend a computer network against a nasty group of professional penetration testers. I’m in the lower right with those sweet sideburns. After college, I kind of moved away from doing infosec and I began to settle into a comfortable web application development career. I still tried to keep up on the world of infosec by reading blogs and following news articles, but it’s pretty tough unless you’re actively involved in the community. Around 2013, I found some co-workers who also wanted to play around with infosec stuff and they let me hop on their private lab to solve challenges, learn some new stuff, and just have some fun. I was hooked back in and I instantly knew I wanted to host my own lab environment to do the same thing. I also wanted to apply some of my software engineer and dev ops skills to try to automate a lot of the boring stuff so I could spend more time exploring security concepts and less time doing admin work. So that’s why I started hacknowledge.io. It is a private network that I’m hosting and also a set of tools for administering and monitoring the network. Here’s how it works: I have a server in my basement running VMWare ESXi and with a few really vulnerable virtual machines. All of these VMs are on a private network that can only be accessed by going through a VPN. I’ve been calling this private network the Threat Net even though, at the moment, none of the hosts are dangerous on their own. 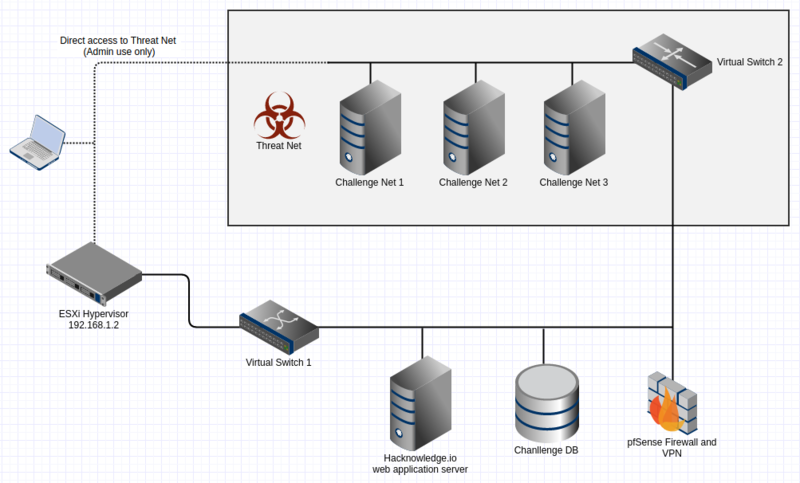 For each vulnerable host, there are a few challenge questions. Answering these gets you points and let you move up the leaderboard. The questions are designed to help push you in the right direction of fully exploiting the machine. They start off relatively easy (e.g. Find the port that a web server is running on) and eventually ramp up (e.g. What is the root password?). Currently there are only 3 hosts. Eventually I’m going to have 5 for the initial closed beta round. The first three are relatively easy to exploit. Spoiler alert: the first host is vulnerable to Shellshock, which is about as obvious as they come. Anyone who knows how to install and run a Nessus scan can figure it out. I’m hoping that I can eventually build out some more difficult challenges in the future, but the closed beta is mostly just a proof-of-concept. In addition to vulnerable hosts, the threat net also has some bots running around doing housekeeping chores like reverting the VMs to a known state every half hour (so you can trash a machine and it will be back to normal so someone else can have a chance). There’s also a bot that just checks to make sure the machines are online and available. 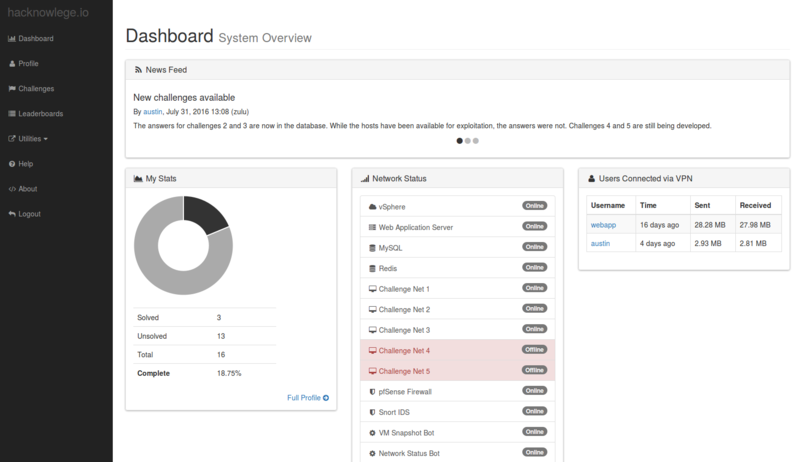 Outside of the Threat Net is a set of hosts that provide a web interface for users to answer challenge questions. In the process of designing and writing all of this, I learned a bunch of stuff. I have a ton of blog entries planned on how I built this thing.